Expeditions Conquistador is a game that could easily be overlooked. If you look at videos or screenshots you will see an average looking strategy role-playing game, but there is more than meets the eye with this one. 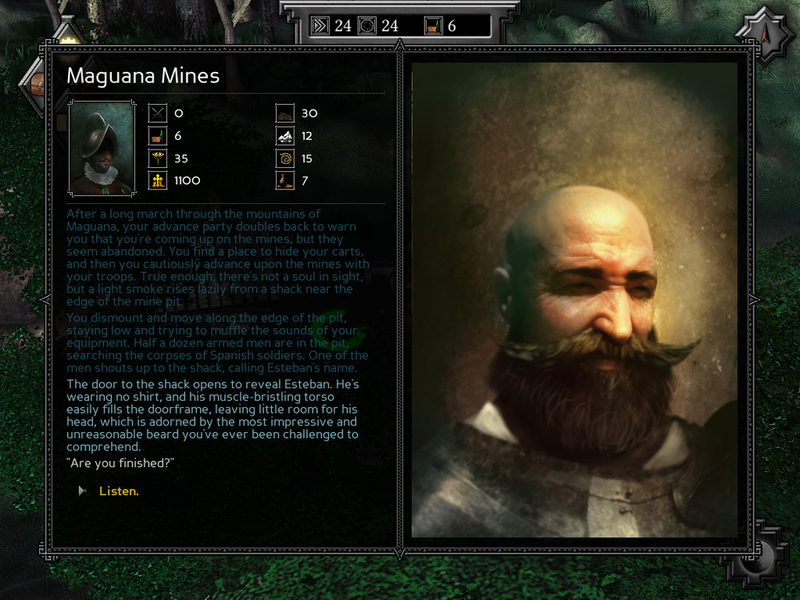 Expeditions Conquistador is full of history, deep strategy, and compelling RPG elements. This is a game that not everyone will be able to sink their teeth into, but those that can will find a diamond in the rough. When you first see Expeditions Conquistador you really don't know what to expect from the game. Some people will expect a simple strategy RPG in the vein of Fire Emblem, and this could be a quick sell for those people. It is so much more than that. The complexity of this game is incredibly overwhelming and exciting at the same time. From the outset, you can see there is definitely some strategy and complexity when you have to pick the team for your expedition. You have a choice between many characters and character types and everything about them will be a factor in your journey. You need to choose a good combination of men and women to round out your team, but their class isn't the only thing that will make a difference. Their belief structure can also be a big factor, and when you make decisions on how to progress at certain story beats those decisions could mean different things to different people. This means that from the very beginning you have to make wise choices. There are so many systems in this game that it can be a lot to follow, and it's a game you have to take your time with. When you start exploring you can only move so far on your map until your team needs to camp out for the night. Once you camp, there are decisions to make. You can auto assign these, for those of us who want a simpler experience, or you can go gung ho and assign certain characters to hunt or guard the camp as well as ration out the food. All of these things can be crucial to getting your characters to the next area as anything can happen -- such as animal attacks, attacks from other people, thieves could come in the night to steal your supplies, and events regarding your people that can change the course of the day. This is part of the deep complexity of the game, and it won't be for everyone. The combat can be difficult, and I would strongly suggest not to turn on Iron Man mode in your first playthrough, because it is brutal and I wasn't ready for it at all. Those familiar with strategy RPGs will feel right at home moving their soldiers along the hexagonal grid as you try to outthink the AI and form a strategy to take out the enemy. You can even make traps and barricades while camping to help you in combat. There are a lot of strategic options during combat, but you also have a lot of decisions to make before you even start fighting. You have equipment to assign, and this will determine how powerful certain weapons will be for certain characters as well as their armor. You can only afford to have so much equipment, so it's crucial how you divide this among your troops and could be the difference between victory and defeat. You also have to look at the character types and how they can help you in the battlefield as they all have unique characteristics; The doctor can be used for healing or the scholars can help with some tactical advantages. This provides for an incredibly deep experience, and is great for those who like a lot of deep strategy in their games. You can even test your skills against others in the multiplayer player vs. player mode. 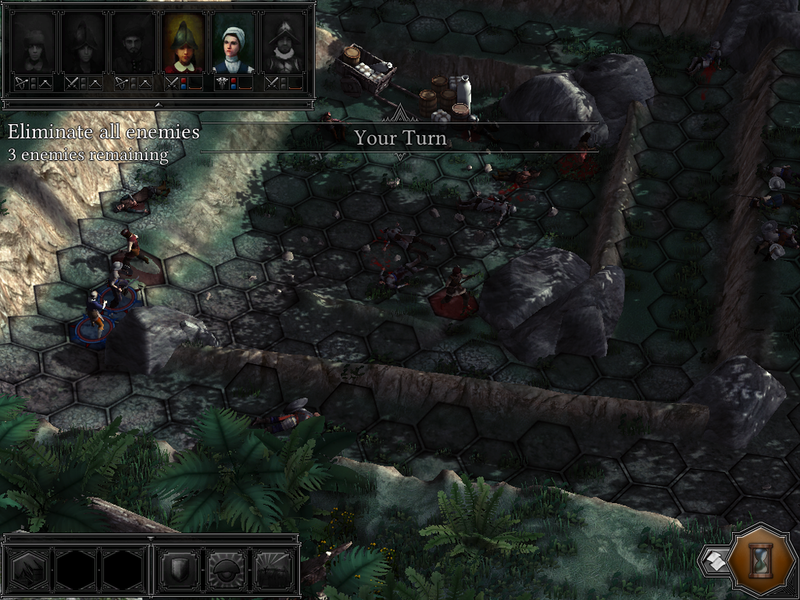 Outside of combat, Expeditions Conquistador has a lot of great RPG elements. You will take missions from the Spanish governor as well as others along the way. The dialogue for this is great and makes you feel like you're in the historical time period of the 1500s. The characters match the setting perfectly, and saying the right thing can give you an advantage. You can use things such as diplomacy to avoid combat in certain situations altogether. You will also have a lot of interactions with your team of conquistadors -- during exploration you may take some time out to get to know a few of them better or make some decisions based on their actions. This can help them trust you or despise you and everyone on your team will react in a positive or negative way depending on your reaction. These decisions range from outside opportunities for team members or even religious beliefs which really adds morality and your own belief structure into the game. This helps to gain attachments to some of the characters, and it is some great storytelling. Finishing Move: I could go on forever telling you about every little detail and the deeper complexities of this game because there is so much to it. The role-playing elements are well done and make you feel a part of the world with your team of conquistadors. The look of the game can feel a bit drab, but the looks fit the time period well despite not being eye-catching. There is a lot of content in this game, and multiplayer for those that want to test their skills against others which will provide hours upon hours of gameplay. Expeditions Conquistador is not for everyone as I feel the complex nature of the game will turn some people off, but for those that want a deep strategy experience it is a must-play game. Expeditions Conquistador gets 4 out of 5 lucha masks. This game was reviewed using a copy provided by the developer Logic Artists.